cavan-ballyhaise-coi -- Erected | By | JOHN J. 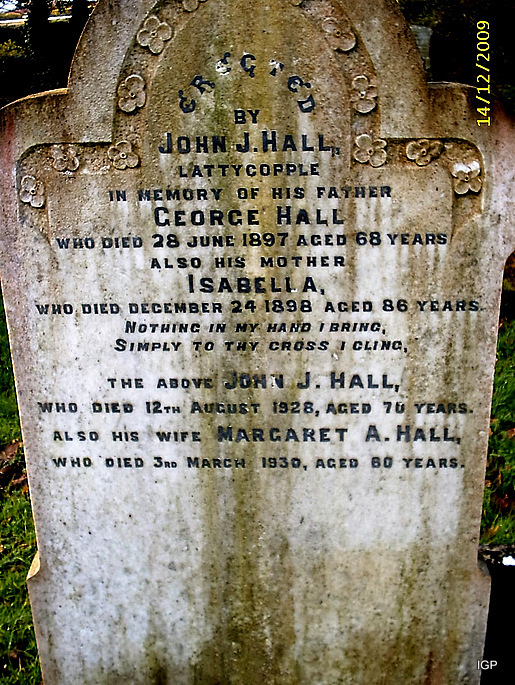 HALL | Lattycopple | In Memory of his Father | GEORGE HALL | Who died 28 June 1897 Aged 68 Years | Also His Mother | ISABELLA | Who died December 24 1898 Aged 86 Years | 'Nothing in my hand I bring | Simply to Thy Cross I Cling' | the above JOHN J. HALL | Who died 12th August 1928, Aged 70 Years | Also His Wife MARGARET A. HALL | Who Died 3rd March 1930, aged 60 Years.